Manchester United vs. Newcastle United has long produced classic matches and a fiery rivalry. However, this particular fixture was not about continuing that proud history. Both managers put out weakened teams and, as was to be expected, they didn’t elicit a memorable match. However, that won’t bother Manchester United fans, as they secured the all important win and witnessed some promising performances in addition. An inexperienced defence, who had previously played, in total, a meager 110 minutes of first team football, stood up admirably to the physical presence of Ameobi, Fletcher continued his recovery from illness whilst Rooney and Anderson put in impressive performances to provide the touch of class. And it was Anderson who nearly opened the scoring in the first half with one of many explosive runs from midfield, only denied a goal by the finger tips of Elliot in the Newcastle goal. Welbeck was as industrious as ever, and, after a searching pass down the wing from Rooney, the young Mancunian cut inside dangerously, but his shot was easily pushed round the post. As has happened all season, Welbeck just could not find the finish after doing all the hard work. Another player who has failed to bring his shooting boots in recent times is Tom Cleverley. His lack of confidence showed, when, after being put one on one with the keeper following a nice interchange between Rooney and Chicharito, he contrived to slide the ball past keeper, post and all. Few chances were on offer from either team, with occasional bursts by Obertan and Marveux ending in nothing for Newcastle. Ironically, you couldn’t help but think Manchester United were in need of a winger to provide an outlet out wide, as the narrow diamond formation forced play through the middle of the pitch. 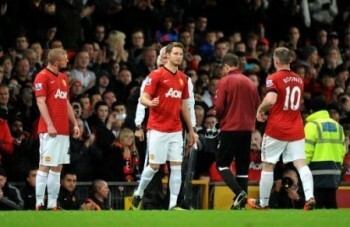 Buttner and Vermijl occasionally ventured forward but were of little threat. Indeed, it was a passage of play through the middle that provided the match’s opening goal just before the interval. Anderson charged through midfield before unleashing a rocket from outside the box that left Elliot with no chance as it flew into the net via the post. Rooney’s range of passing was stretching a diligent Newcastle defence and all three of United’s midfielders were tidy with the ball, yet, apart from a few promising exchanges, Newcastle had staked an equal claim for the match at half time. The second half provided more possession for Man Utd and, finally, the first goal of the season at the Stretford End, scored by the usually profligate Cleverley. He received the ball in a tight space on the edge of the box, and, with a neat turn and finish, found the bottom corner to finally open his account for the season. Powell saw a return to the action from the bench replacing Rooney, yet Anderson may have wished he had been the one to be substituted, as he visibly tired as the game went on, providing a question mark over his otherwise impressive performance. Sparked into action by the addition of Ferguson and Cisse, Newcastle found a route back into the game as Cisse scored with a header from a neat Ferguson cross with practically his first touch and Newcastle fans suddenly found new hope, with an exciting finale looking in store. However, after a Hernandez strike hit the bar at one end and a Cisse over head kick smacked the paint work at the other, the game petered out without much fuss. Only a swan dive from a pitch invader that even Suarez would have been proud of could stir the tepid crowd from its reverie before the final whistle. Tunnicliffe and Robbie Brady appeared late on to make their full debuts. As fans filtered out, they will have been pleased with no further injuries, an encouraging and leading performance from Fletcher guiding the defence and a return for Wayne Rooney as they look forward to more important matters in the Premier League. Sir Alex Ferguson: “”I’m very pleased. First to win the tie in an all Premier League clash. But Newcastle had a stronger team than us physically. We played fantastic football and I think we deserved it.